Notes: Chillingham Castle is a medieval castle in the village of Chillingham in the northern part of Northumberland, England. It was the seat of the Grey and Bennet families from the 15th century until the 1980s. A large enclosed park on the castle grounds is home to the Chillingham Cattle, a rare breed, consisting of about 90 head of cattle. The castle is a Grade I listed building. The castle was originally a monastery in the late 12th century. In 1298, King Edward I stayed at the castle on his way to Scotland to battle a Scottish army led by William Wallace. A glazed window in a frame was specially installed for the king, a rarity in such buildings at the time. The Chillingham Wild Cattle occupy land adjacent to the castle, formerly owned by the Sir John Knott Trust, now owned by the Chillingham Wild Cattle Association (a charity not associated with the castle).The castle occupied a strategically important location in medieval times: it was located on the border between two feuding nations. It was used as a staging post for English armies entering Scotland, but was also repeatedly attacked and besieged by Scottish armies and raiding parties heading south. The site contained a moat, and in some locations the fortifications were 12 feet thick. The building underwent a harsh series of enhancements, and in 1344 a Licence to crenellate was issued by King Edward III to allow battlements to be built, effectively upgrading the stronghold to a fully fortified castle, of quadrangular form. In 1617, James I, the first king of both England and Scotland, stayed at the castle on a journey between his two kingdoms. As relations between the two countries became peaceful following the union of the crowns, the need for a military stronghold in the area declined. The castle was gradually transformed; the moat was filled, and battlements were converted into residential wings. A banquet hall and a library were built. In the 18th and 19th century the grounds underwent landscaping, including work carried out by Sir Jeffry Wyattville. 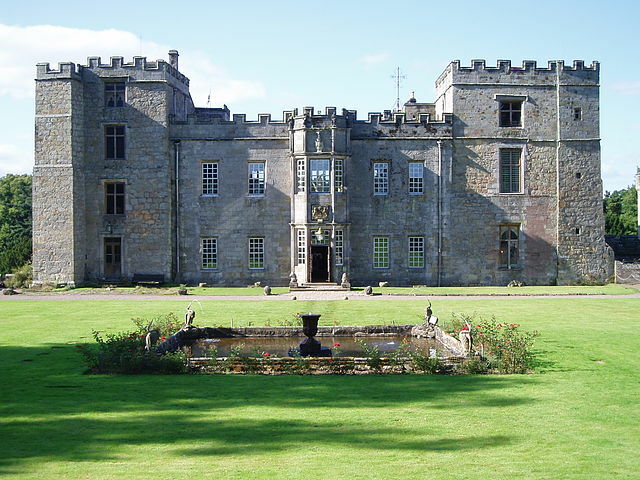 The once extensive park, now under a separate ownership from the castle, is home to the famous Chillingham Wild Cattle.During the Second World War, the castle was used as an army barracks. During this time, much of the decorative wood is said to have been stripped out and burned by the soldiers billeted there. After the war, the castle began to fall into disrepair. Lead had been removed from the roof, resulting in extensive weather damage to large parts of the building. In 1982, the castle was purchased by Sir Humphry Wakefield, 2nd Baronet, whose wife Catherine is descended from the Greys of Chillingham, and Wakefield set about a painstaking restoration of the castle. Sections of the castle are open to the public, and holiday apartments are available for hire.